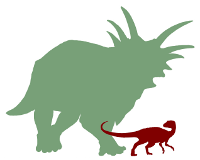 Want to advertise The Open Dinosaur Project on your blog or web site? Here are a few logos that you might like to use. Credits: The dinosaurs are modified from public domain images of Styracosaurus and Abrictosaurus drawn by Mariana Ruiz (who gave her permission for us to modify them), and the logo was assembled by Mike and Andy, with Matt’s input.